The Ayrshire Roads Alliance, on behalf of East Ayrshire Council hosted a free winter resilience event for local residents and community groups. The informative event provided a valuable insight into the Alliance’s winter preparations, with guest speakers from MeteoGroup and Vaisala explained the science behind forecasting winter weather and winter management weather stations. 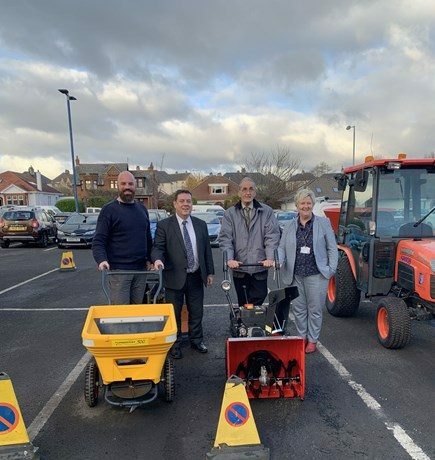 Officers from the Alliance and Outdoor Services then invited participants outside for a practical demonstration of winter gritting equipment including pavement gritters, snowblowers and tractors. After a short break, the second half of the event focused on operational and future changes to the Alliance and Winter Resilience providing details of the new gritter tracking system available now on the Alliance website. The event closed with a presentation by David Reid from Ochiltree’s Gritter Gang, a community resilience group that has been formed to help keep pavements clear during periods of severe weather. Stewart Turner, Head of Roads: Ayrshire Roads Alliance said: “I would like to thank everyone who attended our Winter Resilience Conference, especially representatives from our community groups who support our gritting efforts. We are in a very strong position with 28 community groups providing additional support with pavement clearing. The Alliance is committed to building on this strong partnership and encouraging even more communities to follow the example set by Ochiltree’s Gritter Gang.